Jacoby Shaddix is the lead singer and only remaining founding member of the rock band, Papa Roach. He shares the responsibility for writing the band’s songs with Tobin Esperance, the band’s bass player. 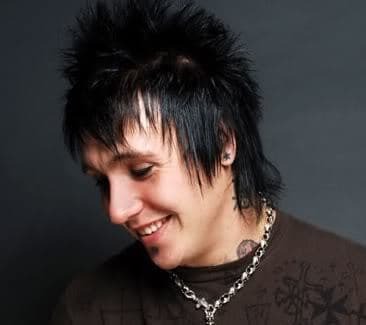 Shaddix was born July 28, 1976 in Vacaville, CA. Papa Roach was founded in 1993. Shaddix married his high school sweetheart in 1996. They are still together and have two sons. Jacoby Shaddix hairstyle is cool. He currently wears it relatively long and has it spiked on top, producing a sort of Emo look. Even when his hair was short, though, he preferred the spikes and had them sticking up all over. Trying to style one’s hair to match his could prove easier than many imagine. The easiest way to do it would be to dry the hair with the head hanging upside down, then apply a generous amount of gel to hold the spikes in place when straightening back up. The spikes can still be achieved without hanging upside down if one wishes to take the time and pull each spike up individually and apply gel to hold it their. This method has the advantage of allowing one to choose the thickness and number of spikes one has standing out. ok i know if anyone get s on here again after this. They’ll see what i typed and comment things makign it seem like im a douche. ok i looked at this at first i liked the styl;e. but looked at it at angles. Yjid is one of the worst. il lexplain what i mena. i think it’s cool for him. not my tihng. but he shoudl grow his angs out more that would amke sense it looks weird int he front. But me im planning on an emo style. dye it black and gets tips dyed. but me i do tihnk this hairstyles good for him but id edit it for yourself.